"3LA1, V-348" by Timothy K. Perttula and Robert Z. Selden Jr. CONTEXT INFORMATION: Found in a grave on the Henry Moore (Battle) place, 1926. Obtained from Dan Jenkins. DECORATION: The rim has a row of tool punctates under the lip and a second row at the rim-body juncture. The remainder of the rim has horizontal brushing marks. The vessel body is characterized by narrow vertical ridging, with vertical brushing marks between the narrow ridges. Belcher Ridged, var. 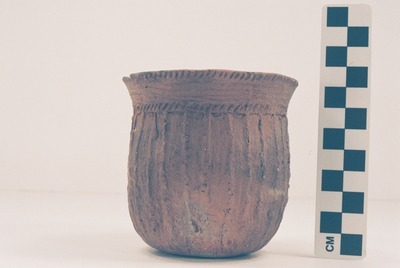 Wilson’s Island jar (5425-677).